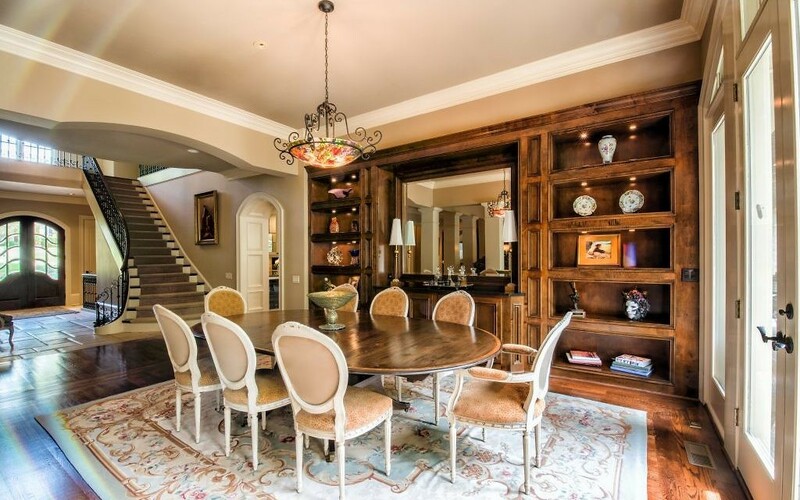 Judaic pieces and whimsical paintings adorn the inside of French estate in East Cobb. 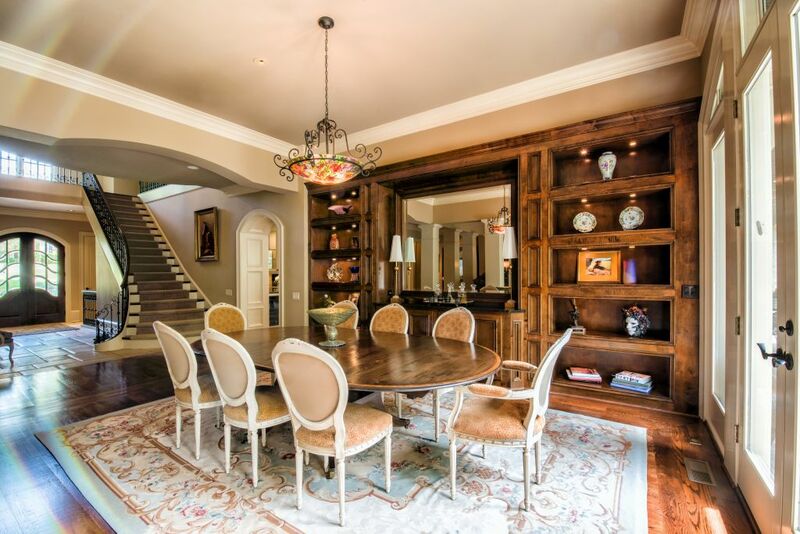 The formal dining room houses the Alifelds’ Judaica collection and their son’s glass vessels. The light fixture was commissioned to match the library sofa’s velvet floral fabric. 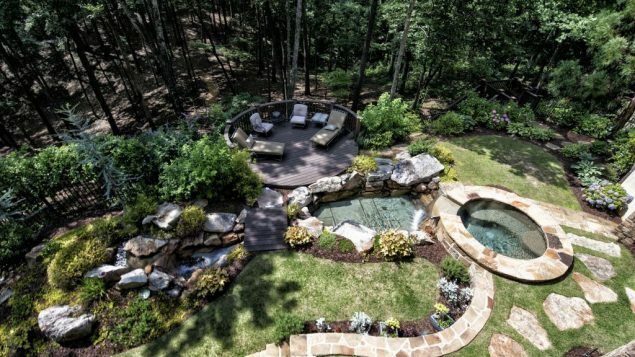 Cheryl and Warren Alifeld hired Marshall Veal in 2001 to build their 7,500-square-foot, custom-designed home in East Cobb. The house itself is a work of art. Dramatically high ceilings and a spiral-staircased foyer reliably predict what’s inside: a sprawling, open, uncorked, panoramic, Parisian vision of an artist with handcrafted statements in luxurious but not fussy exuberance. It is thoughtful but relaxing, romantic but organized — what one expects from a designer in her own home. Take the tour with Cheryl. 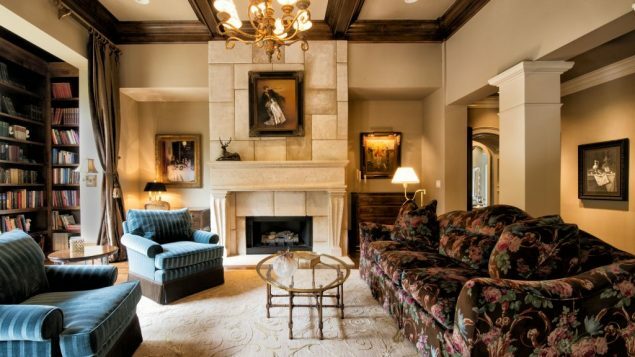 Jaffe: How would you describe your home’s style? What mood do you want to create? Alifeld: We wanted space for our children and grandchildren in a country French setting. We live mostly on the main floor. Upstairs are three more bedroom suites, and downstairs is built like a mountain house with a lodge rec room area with natural river rock, billiard table and fireplace. The lush streams and trails behind the house lead over Owl Creek to the Chattahoochee River. 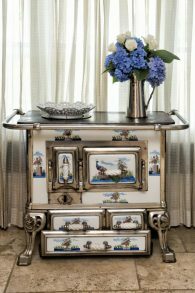 Cheryl Alifeld designed her office off the kitchen around this antique stove from her parents’ home in Missouri, where they had a stove in every room. 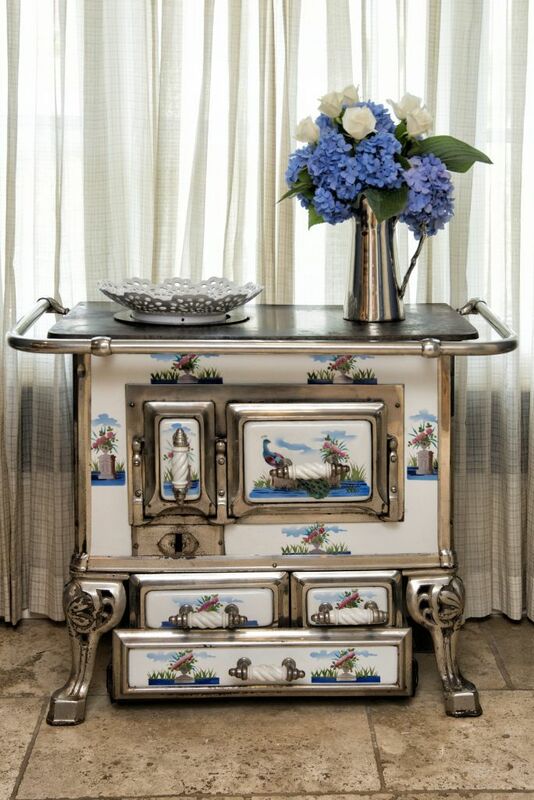 My interior design motivation in the kitchen was this antique stove with a peacock design from my parents’ home. They collected antiques and had a stove in every room. Jaffe: What are some of the unusual features of your home? Alifeld: The view of the outside — we added the cantilever decks after much thought. 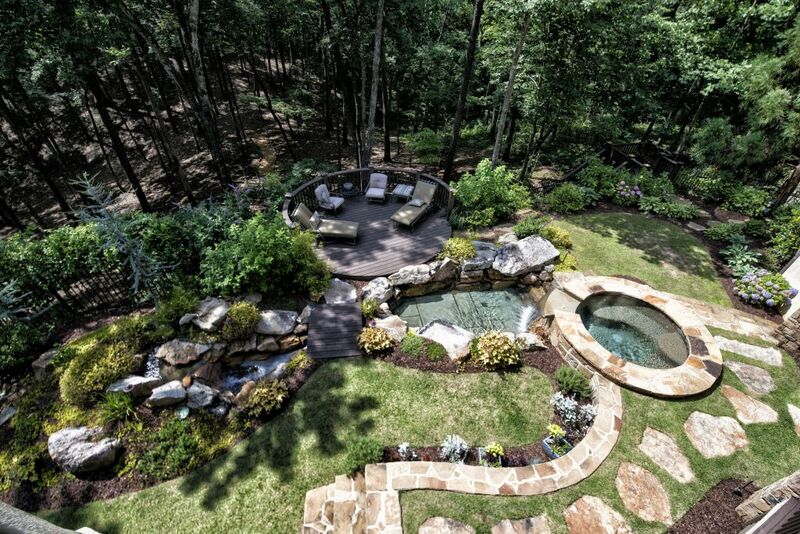 It’s relaxing to sit out here with morning coffee and gaze out in privacy. My favorite room is the library because books are my best friends. I painted the Spanish dancer, “El Jaleo,” over the mantel. The library is Cheryl Alifeld’s favorite room. She painted Spanish dancer “El Jaleo” over the fireplace. I especially like the floral, jewel-toned velvet fabric on the sofa in here. I had the adjacent dining room chandelier reverse hand-painted (by an artist at the Scott Antique Markets) to match the lush rose pattern. 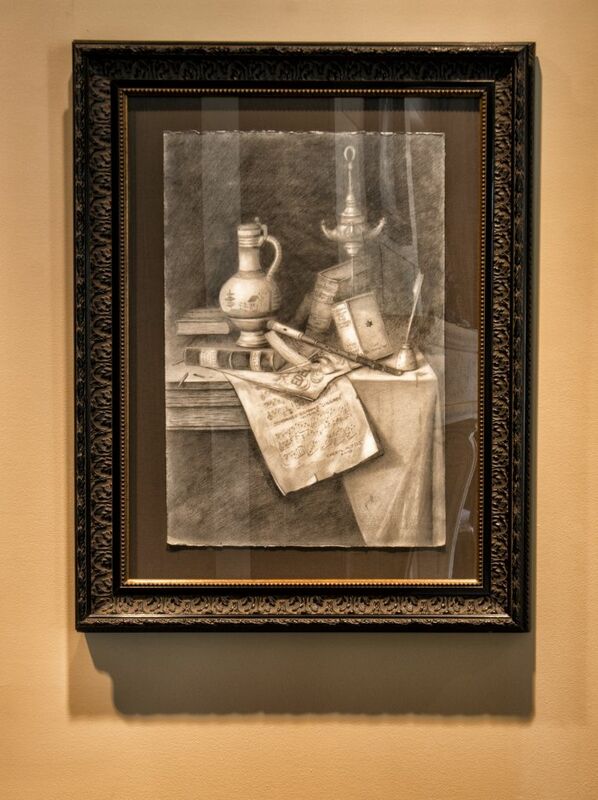 Cheryl Alifeld created this evocative pencil drawing, capturing husband Warren’s German birthplace, Bad Driburg. My son is a glass artist in California, and we display his pieces in the dining room along with our Judaica. Jaffe: You are a fine artist. How would you describe your training and passion? 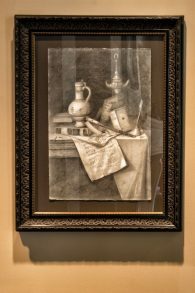 Alifeld: Growing up in Joplin, Mo., my parents made sure that I had private art lessons. 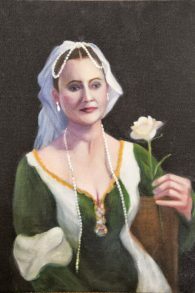 As a base, I learned in the style of the Old Masters. I tend to paint women because they are just outright prettier than men (laughing). 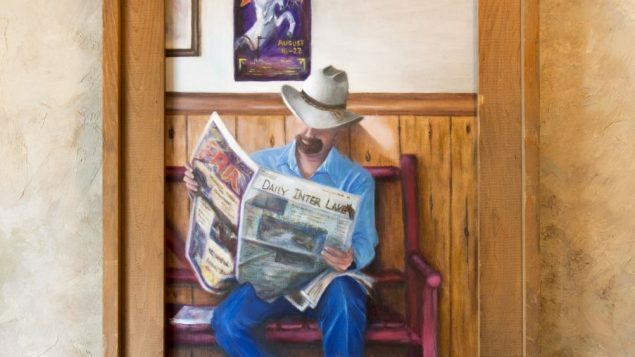 It varies, like this real-life cowboy just sitting on a bench in Montana reading the newspaper about a rodeo that has the poster of it right behind him. I call these spontaneous inspirations my Norman Rockwell moments. 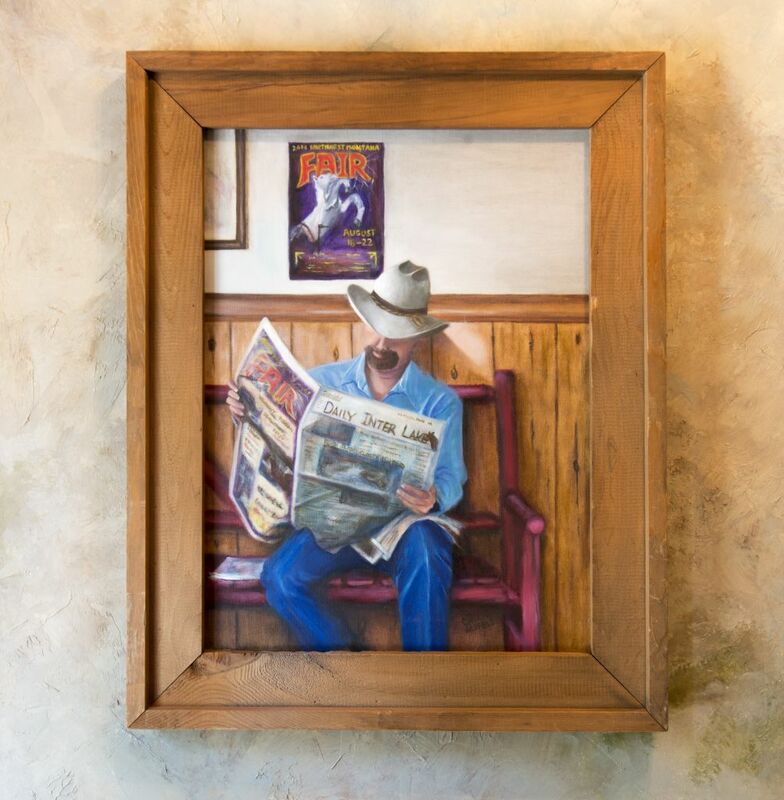 A visit to Montana inspired this painting of a rodeo cowboy, an example of what Cheryl Alifeld calls her Norman Rockwell moments. In Atlanta I had gallery space at Tula on Bennett Street and now paint at the Chastain Arts Center. We have a very lively Friday art group. My most special paintings are the ones I did of our grandchildren swimming and diving for sand dollars near our Bonita Springs, Fla., home, displayed in the living room. I don’t rush to finish a painting. I often observe them midway and continue to build upon it, like this pearl-draped model. And don’t ask me how long it takes to complete a portrait (laughing) because it takes a lifetime. 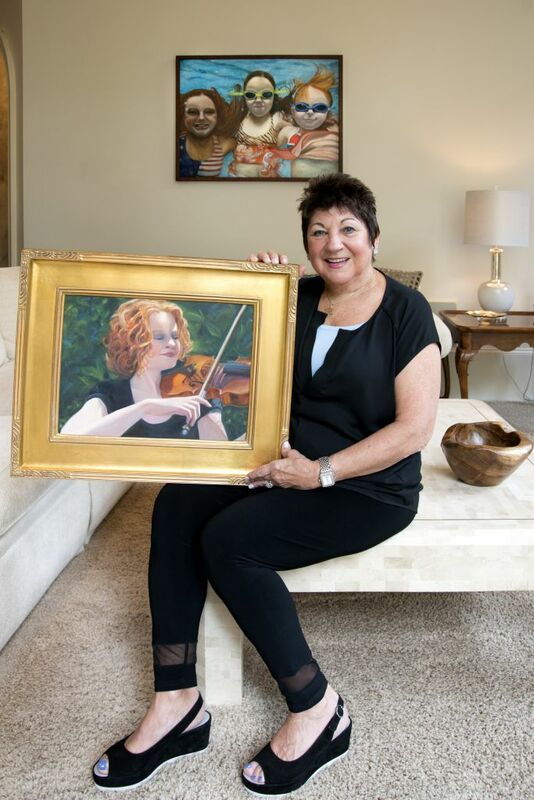 Cheryl Alifeld holds “Sweet Symphony,” a drawing of a young musician for which she won a regional award at the Chastain Arts Center. In the background is one of her favorite paintings, “Bathing Beauties,” which she created of her grandchildren visiting in Florida. I am a former a member of the National Color Marketing Group, which is highly regarded as the forecaster of color palettes and trending for major industries like paint, carpet and even selecting interiors for the transportation industry. 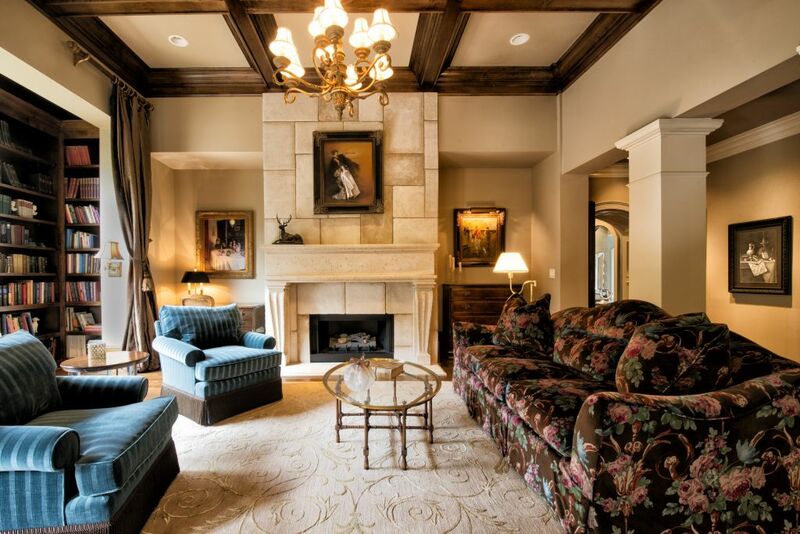 My interior design career spans 40 years in residential and commercial projects in Sandy Springs and Buckhead. My designs were published in newspapers, magazines and on television. Jaffe: Describe the pencil drawing you did as a tribute to Warren’s German roots. Jaffe: Who are your favorite artists? 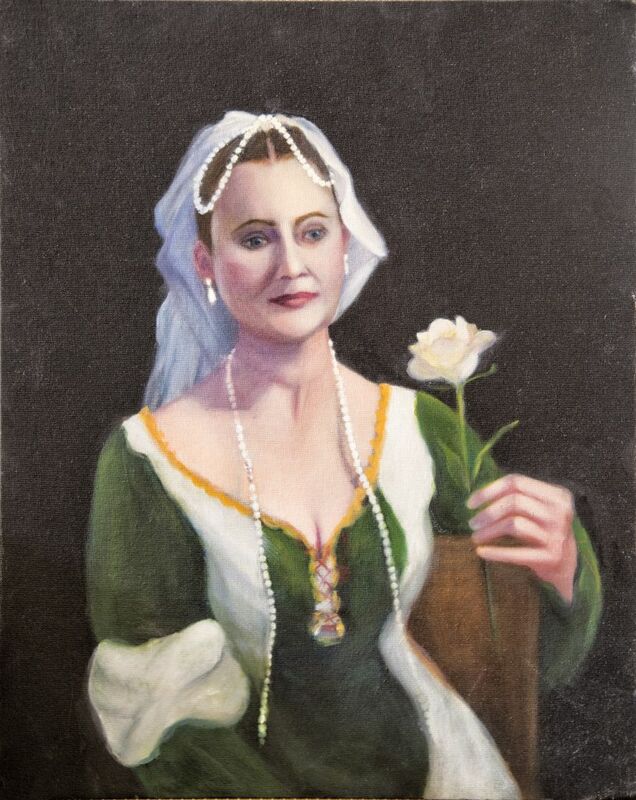 This Alifeld portrait, created with a live model, depicts royalty. Alifeld: John Singer Sargent was recognized in the late 20th century as a leading Edwardian-era luxury portrait artist. It was said that Jewish women gave him a lift by hiring him early on in his career. I don’t collect art by who did it. I buy things that I am attracted to. I have to really be drawn to the piece. That being said, I like a variety of mediums. 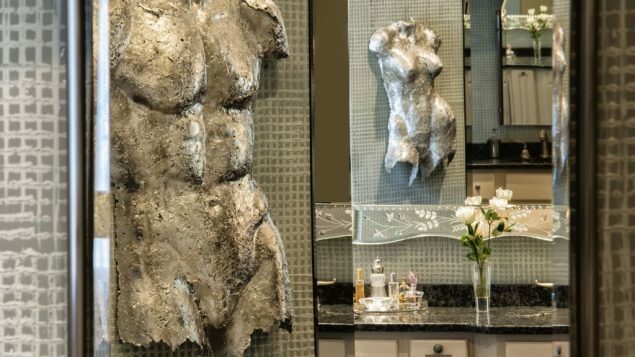 In the master bath are male and female, life-sized metal body casts. In the master sitting room we have an original antique poster for Capri perfume called “Carthusia” (circa 1890). I adore its use of color and whimsy. 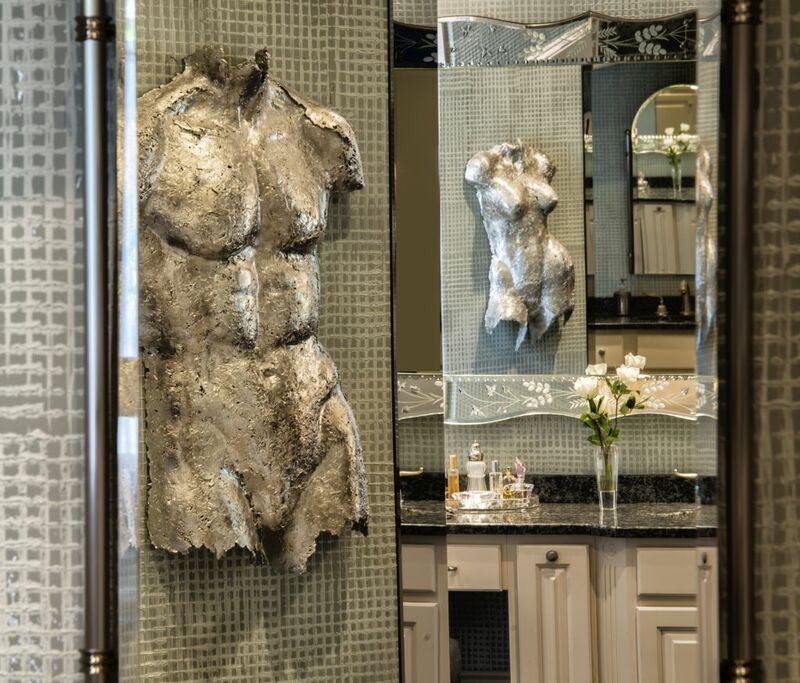 The master bath has contrasting male and female metal casts of human torsos. Jaffe: You maintain two homes. How does that work designwise? 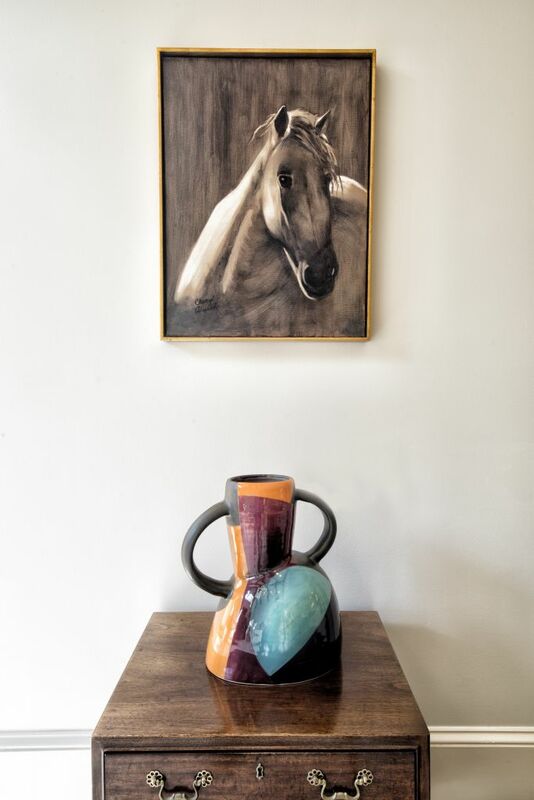 Cheryl Alifeld’s horse painting hangs over a multicolored ceramic piece, mixing contemporary and traditional styles. Alifeld: I strive to have different styles. I’m now working on a “she-she” salon, a lady’s room for all my female-themed art in our condo. Having just sold this home, we are downsizing to a new one-level where we mixed in our more traditional pieces with contemporary. In Florida we have a more contemporary feel with traditional accents. I love light and brightness, and my colors are alabaster and sky blue. Jaffe: In the rec room, I see a sign that sums up your lighthearted side. Alifeld: Yes: “What if the hokey pokey really is what life’s all about?” I treasure each and every day.